This is a wonderful salad...you can't go wrong with bacon, onion, blue cheese and romaine! Heat 1 tablespoon of the olive oil in a large skillet over high heat. Add the onion and bacon and cook until bacon is crispy. Remove onion and bacon from pan. Add the balsamic vinegar and 1 tablespoon of the olive oil to the skillet and reduce for 2 to 3 minutes. Remove from heat and set aside. 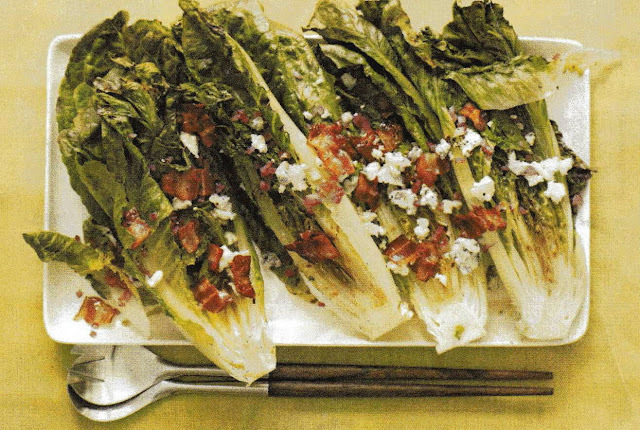 For each serving, place a half head of romain cut-side up on a plate and drizzle with the balsamic dressing. Sprinkle with blue cheese and top with bacon and onion. Season with freshly cracked black pepper.